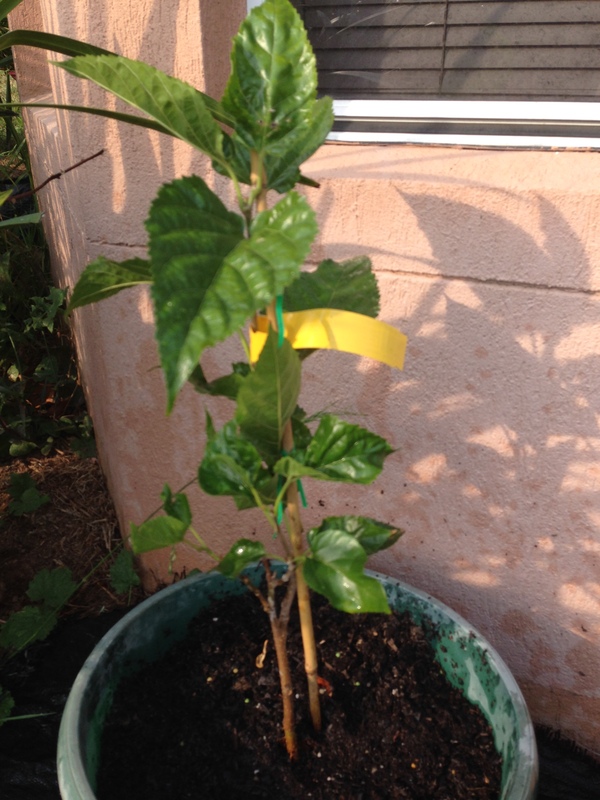 This variety performs excellent in the Subtropics. 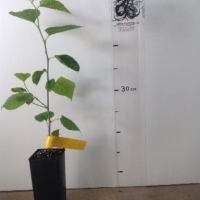 There has been feedback that this variety doesn't perform as well in Temperate Climates. 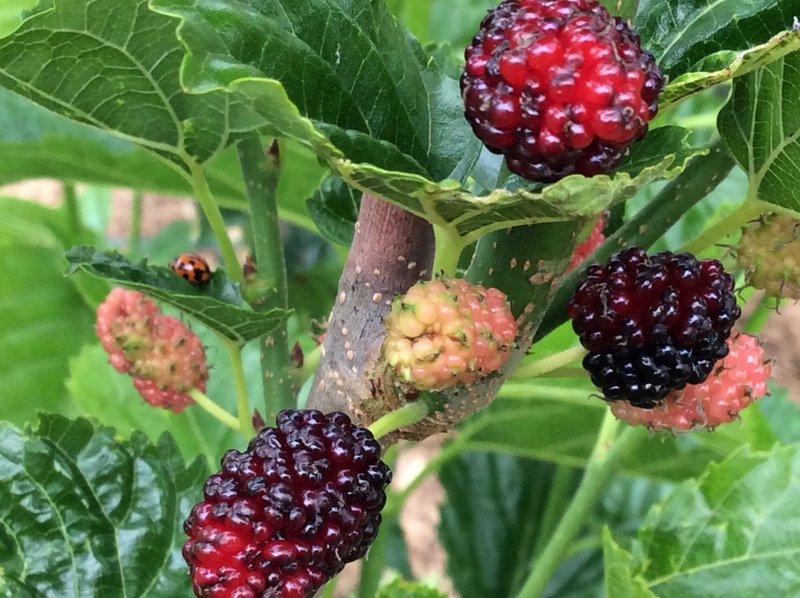 you can get two crops a year off your mulberry with pruning, it will drop it leaves in the autumn/winter and them fruit in the spring, if you prune it when it finishes cropping it will fruit again in late summer/autumn. Enjoy. It is like the Beenleigh black but the size is not as large. It is slightly more tart than this one. 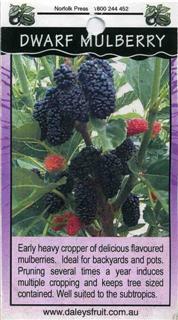 But the Dwarf Black Mulberries has multiple cropping periods with pruning and is suitable to subtropical climates. Comments: - After the tree has finished cropping in the spring, cut 1/3 off it for a second crop in the autumn. 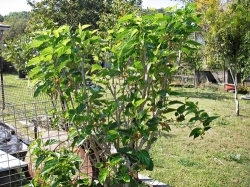 There are no fig birds around in during the autumn crop to eat all the fruit. 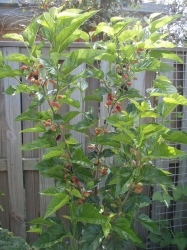 Purchased this in 2008 as I enjoy mullberries but don't have the room left in the yard for a full sized tree. Growing this in half a wine barrel will keep the tree dwarfed and I'll still get a "taste" of fruit off it. 2010- I've revised my opinion of this- the vigorous growth means heaps of mulberries off the new growth. 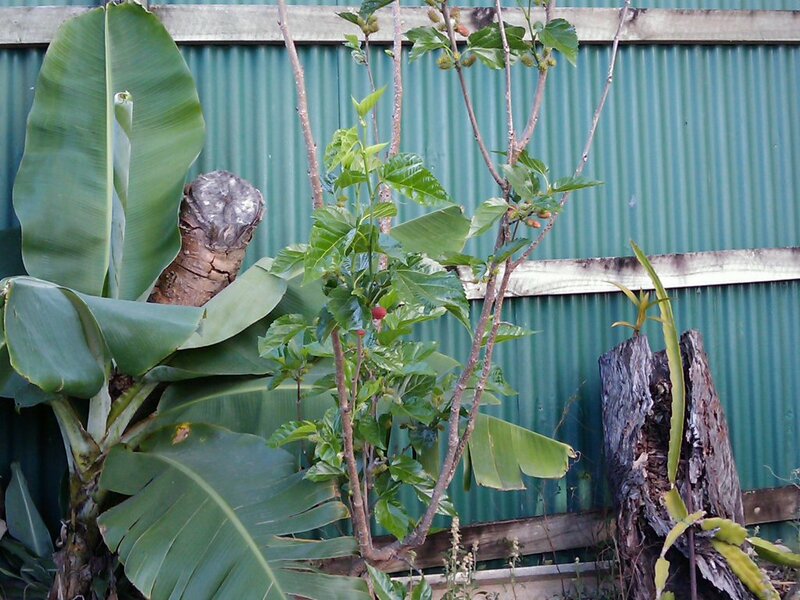 Pruned this in late summer when I repotted it into a larger pot (note to self- termites love half wine barrels left in damp gardens). Got an early autumn crop of mulberries from the new growth!! I bought this in late summer 2009 and I transfered it into a large pot and got a small handfull of berries. It's now mid August 2010 and it has more than 100 fruit growing that should be ripe in a few weeks and I am hoping for a second crop in mid summer. 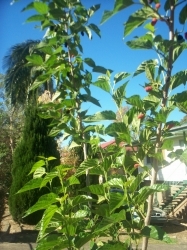 A fantastic little tree and I can't believe that it has produced fruit so quickly a hit with my three year old I can tell you. 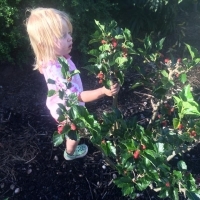 He is eagerly awaiting until the berries are ripe to eat them which means they must taste pretty good if my fussy eater loves them. I am considering getting a couple more and gifting them to friends and family for Xmas. 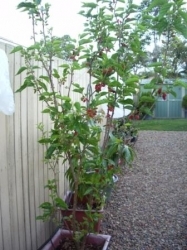 I am just using a large pot I got from bunnings its probably 40 - 50cms high you would need to transplant the tree every 2 or so years into a larger pot. Another idea instead of a pot is bonsai bags I have a couple apples and madarins in bonsai bags and they are growing quite well. 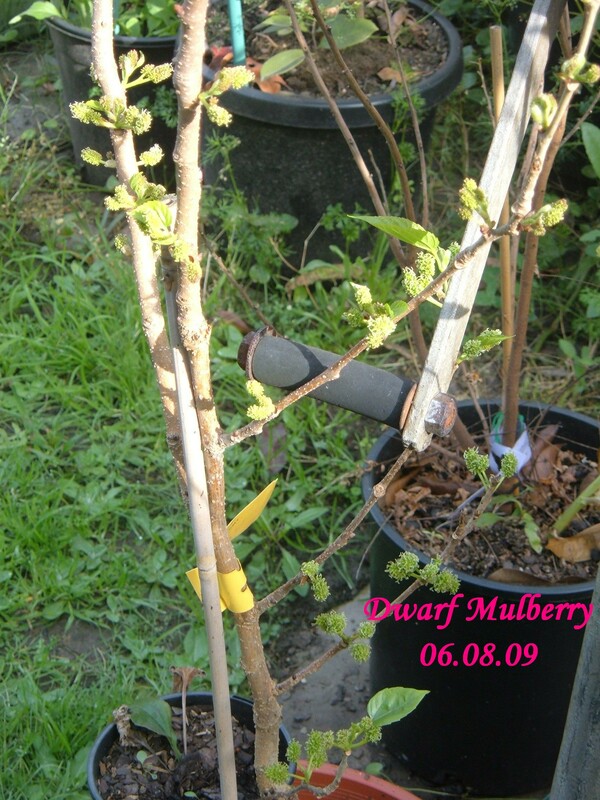 i just used an all purpose good quality potting mix with some compost but the dwarf black mulberry that i have is quite tolerant. Except for some chook poo and water I don't do anything to it. Comments: - Grows extremely fast! 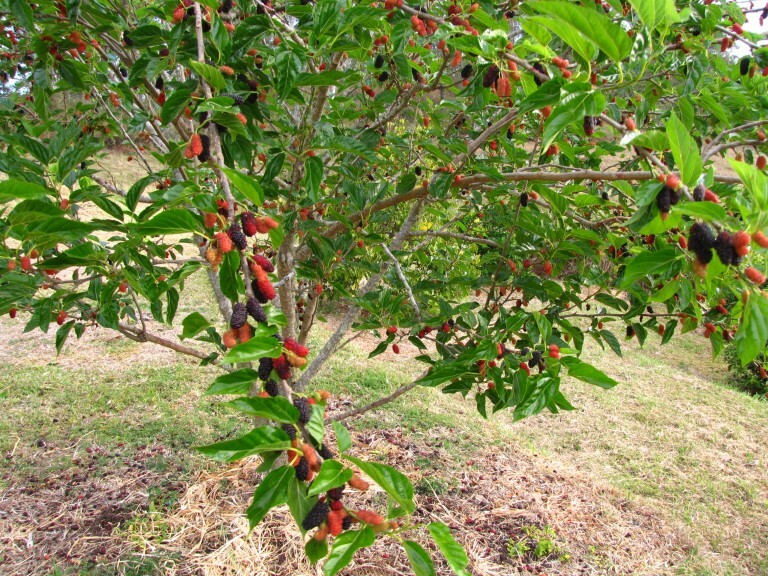 Fruits prolifically for a young tree, but the slugs love it! 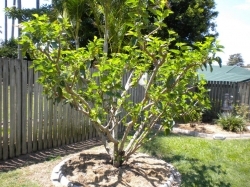 Question: How much to prune this after fruiting? 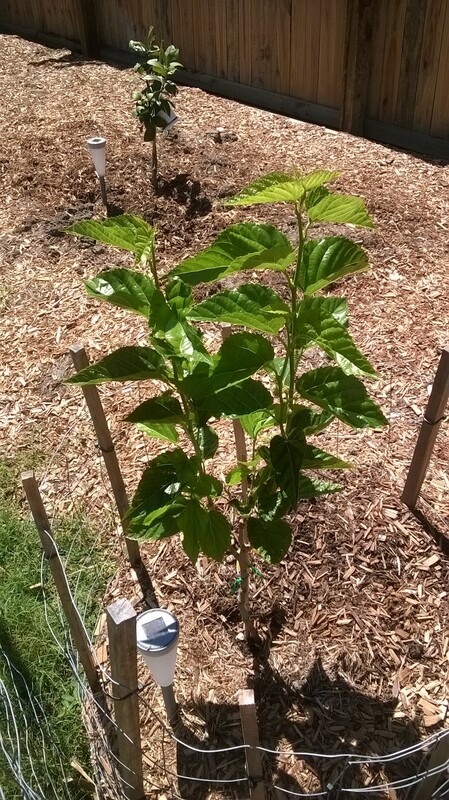 September 2014:Planted May 2014 and was just a stick when taken out of box (broken when being removed). Mulberries are hardy as they come and it has rebounded incredibly well. 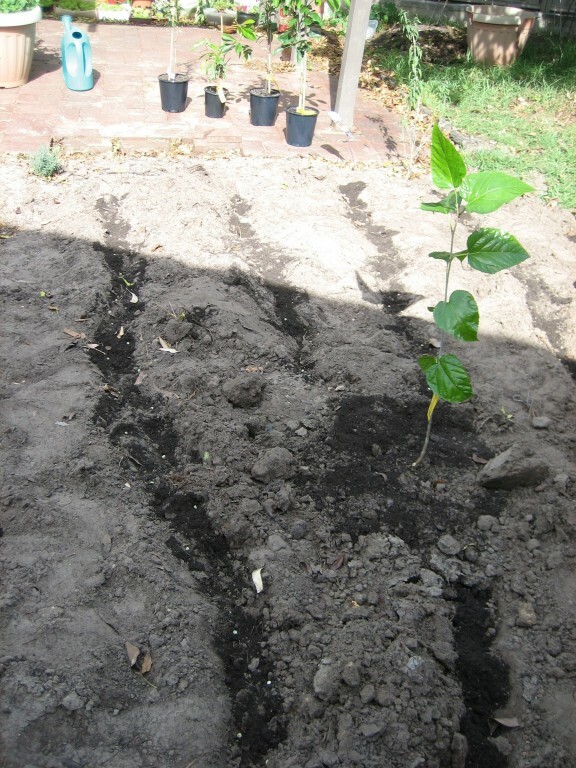 Use of good quality soil, compost and plenty of mulch. 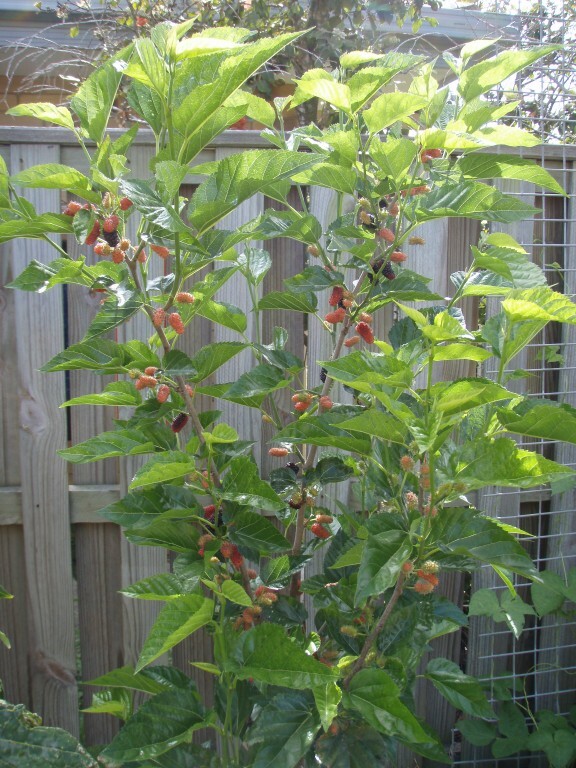 This produced new growth in the depth of winter (even produced a berry). November 2014: Growth slowed a lot in September after intial reports. I suspect this is because it is quite a heavy feeder and is looking for nutrients in the soil. I added some Dynamic Lifter to the soil and it has shot off again. I cut the tips of this to see if it would produce multiple stems - which it has done so effectively. 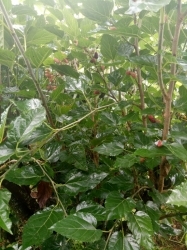 More fruit has set on the plant (7 or 8 berries at this stage) so it would appear this will crop throughout the season multiple times if conditions are right. Feed well and this will be a very easy plant to grow! 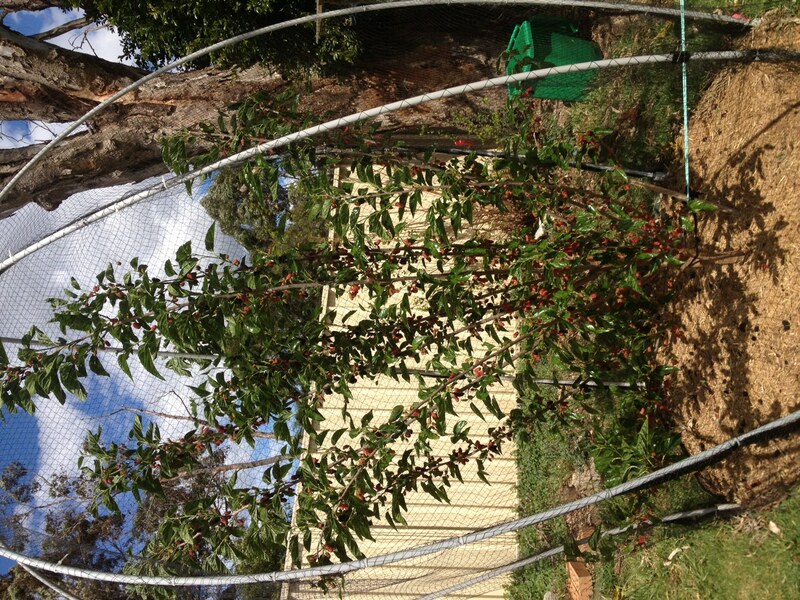 May 2015: This plant loves a good feed and needs pruning, that said, any pruning results in fruit - consistently. It is quite simple to grow and requires very little maintenance. 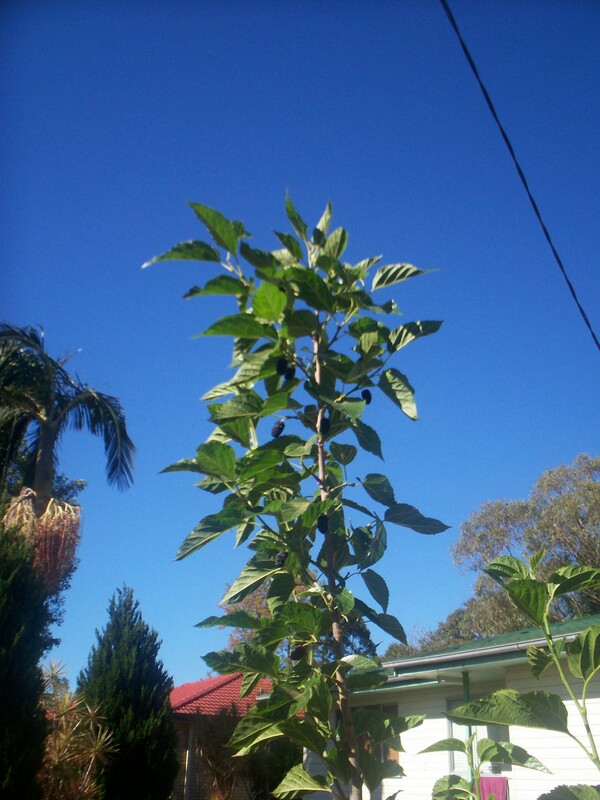 It is hard to imagine that the 30cm that I planted is now a couple metres tall with multiple limbs... 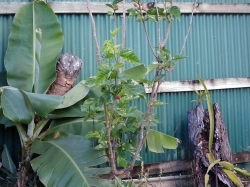 The trunk of the plant has at least quadrupled in size. It is a simple plant to grow but I have to beat the birds and dogs to the fruit. Height 3 mts (20/11/2012) I keep it trimmed to this height . 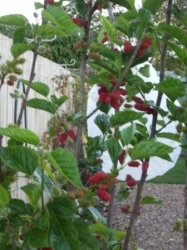 This mulberry gets massive amounts of mulberries on for its size . Those grey birds with the black head think all there christmases have come at once . 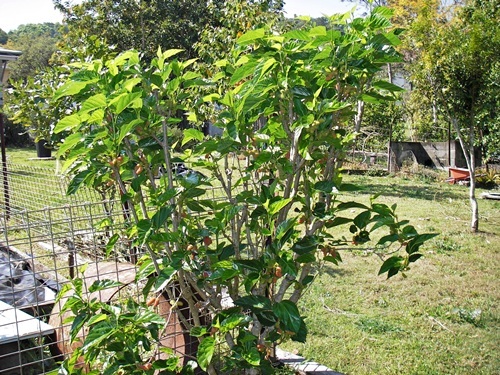 Comments: - I have taken this plant to three places now. Uprooting it every time. It is a fighter and bounces back with a vengeance each time. Love love love this plant. This plant I bought on a whim as I passed it at a nursery. 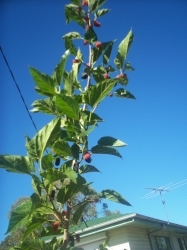 I didn't realise there were dwarf fruit trees until then. 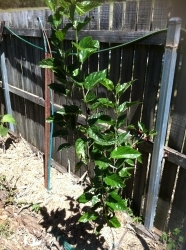 It has begun my love of fruit trees. 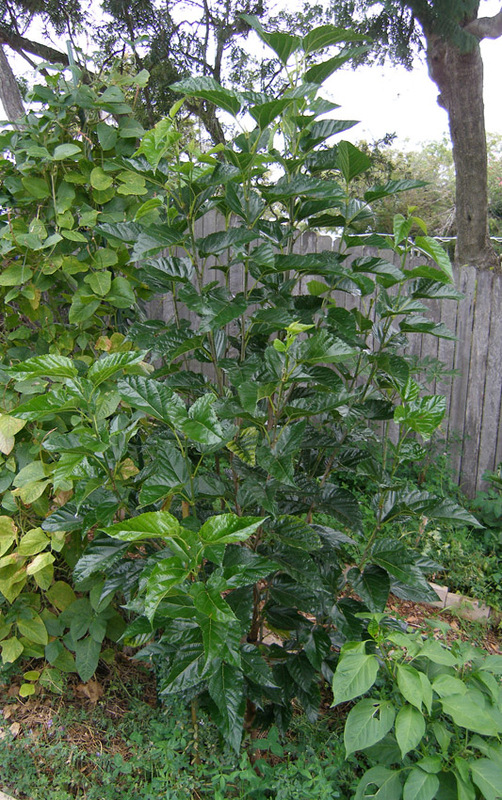 The plant is rather bare at the moment and a couple of leaves are yellow. It is growing in a pot with store bought compost and potting mix. It has been raining steadily for around a month now and although it has good drainage i think this may be part of the issue. The actual fruit reminds me of hot summer days when a child. 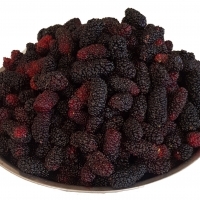 I also love mulberries fresh or baked in filo pastry with freshly whipped cream. I have not had any issues as yet. 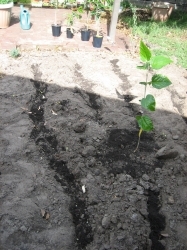 About to plant in ground. Has taken off since planting in ground. 5 new branches and a fair bit of fruit. The new branches are lower than the original branches and seem to be a lot longer as well. 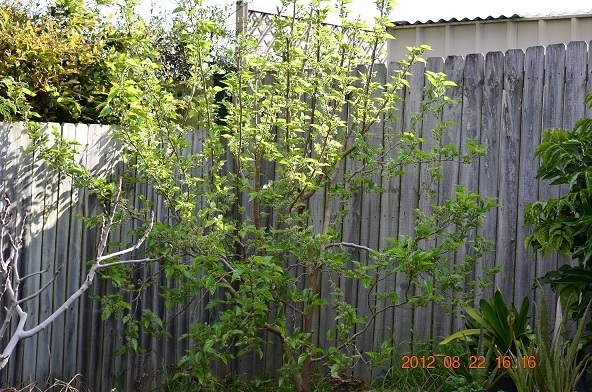 I don't think this tree is grafted - hope not or I these branches will take over the tree. 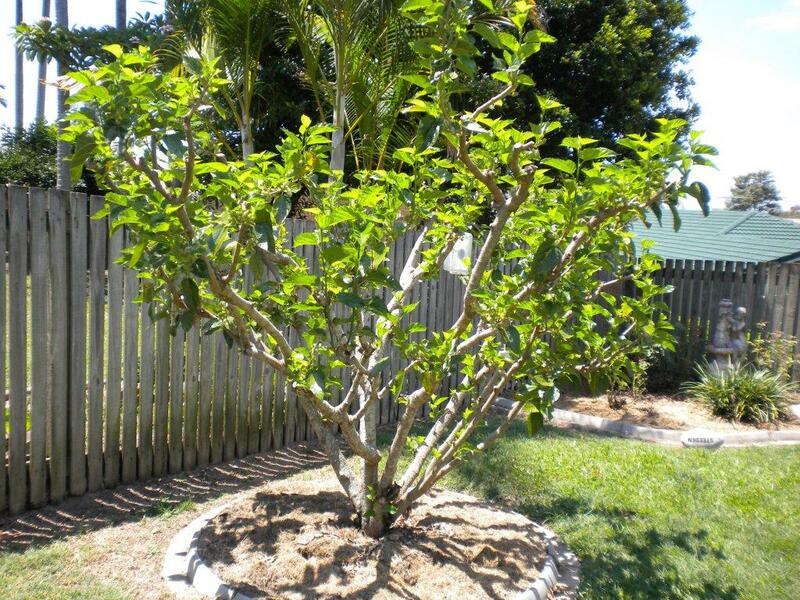 Just tip pruned above branches which they they shot laterally. 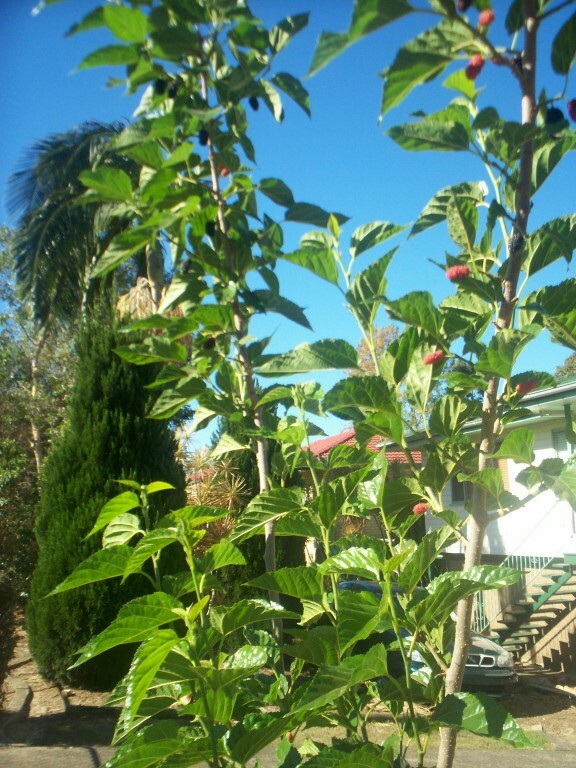 Been 6 months since then and the tree is already covered in masses of leaves and fruit that just starting to change colour. Very satisfying plant to grow. 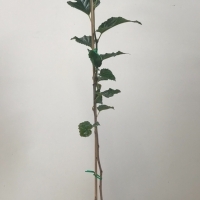 Has grown 0.7m since tip pruning. 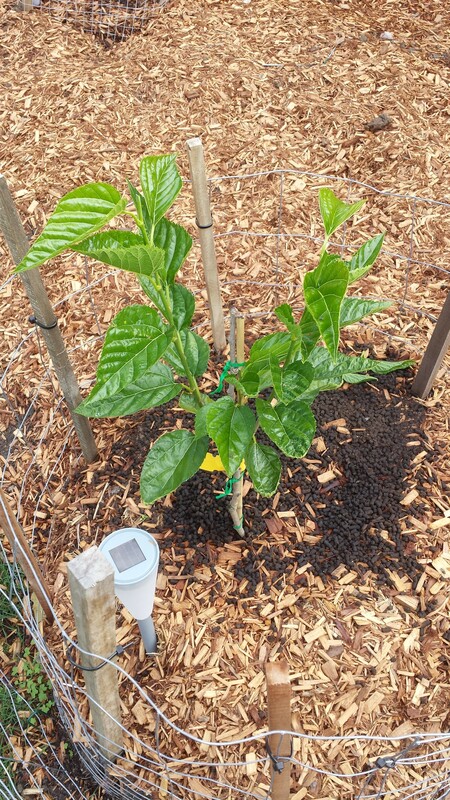 Comments: - First year in the ground (spent 1 year in a pot and didn't grow much at all) and it is absolutely brimming with fruit! We live on the South Coast and the tree is absolutely thriving! 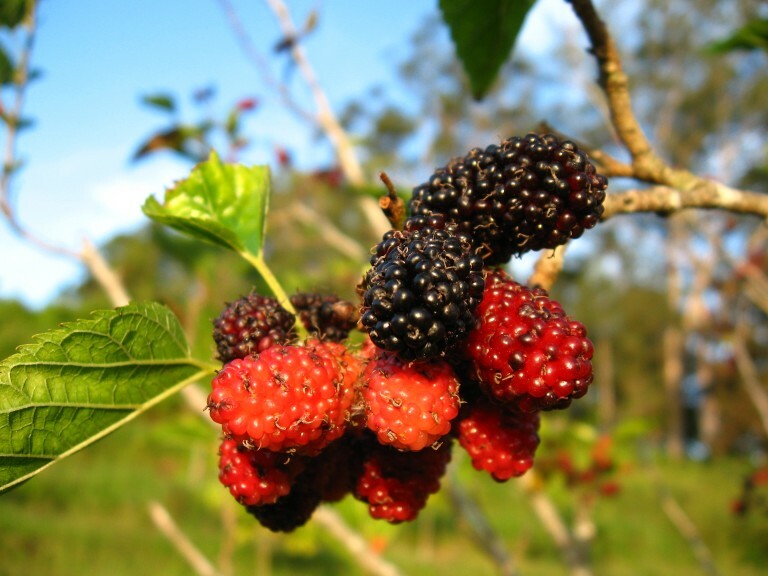 I LOVE the taste of the fruit reminds me of my childhood growing up picking a friends tree! I loves this plant, as soon as it start budding, it is setting fruits. It had grown double in size now, I don't know if I should cut it back, as I don't want it to get to bushy or too tall. The mulberry must be the best tree ever for Warners Bay. It doesn't mind drought too much, and comes back vigourously with rain. It loves Newcastle! 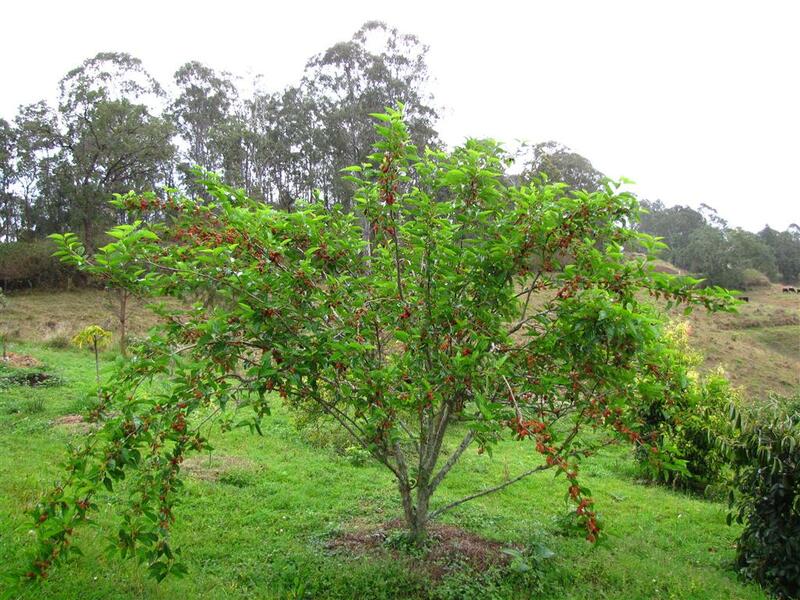 Fantastic little tree, lots of fruit this spring. 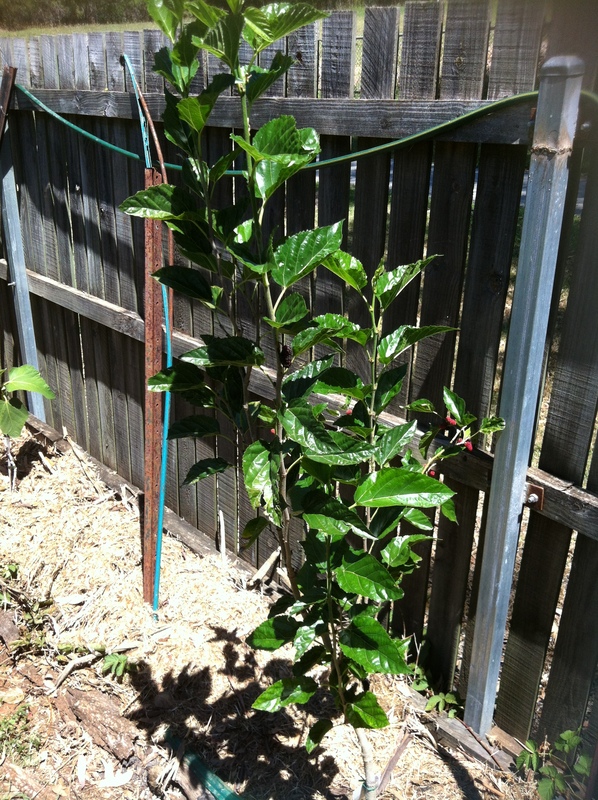 I planted this one so I could cover it, so I have a better chance of beating the fruit bats and birds to the fruit. Fertiliser or Organics Used: none as yet. New planting for this year from cuttings. 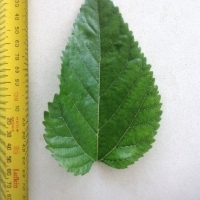 Leafinf up well and even had fruit which I removed as the cutting was only in the ground a month. 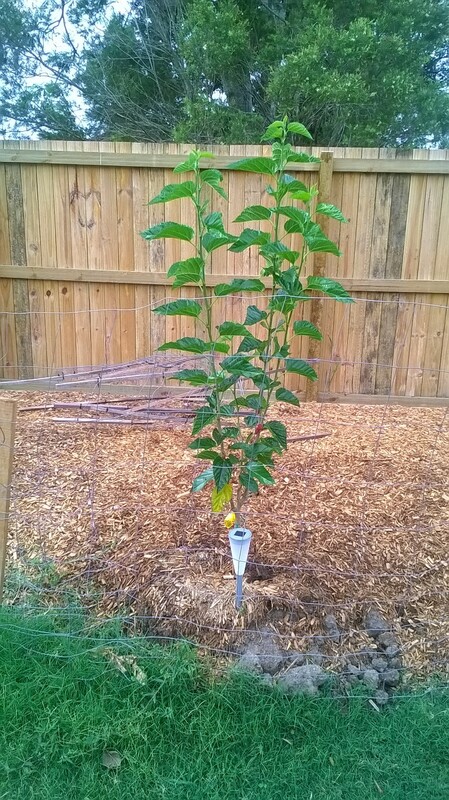 New tree, planted 6 months ago and doubled in size since. Had a few fruits already. This is not a dwarf one. it was grown in pot for 7 years before I put it into the ground in 2011. It is now triple in size. I prune it hard in late winter. Grow happyly in clay soil with no care. now full of fruits. Does nothing until spring then it takes off with very fast growth, started fruiting and has doubled in size by summer. Tree is now over 3m tall, grows super fast! 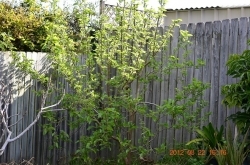 keep pruning and it keeps fruiting from spring to mid autumn. Cut it back by 2/3 during winter which has now made it more compact with very bushy growth now in spring. 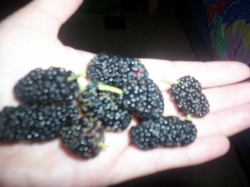 Taste is milder than blackberry but still very enjoyable, a great little tree for the backyard. 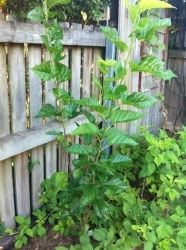 I am espaliering my black mulberry. Very happy with me wee tree, it has fruited handsomly since purchase. Allegedly dwarf, now pollarded so we can get a net over it to keep birds from spreading the unfortunately very viable seed. Fruits prolifically, but if we like the taste of the shahtoot this one will come out. 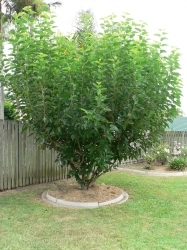 What a wonderful little tree. 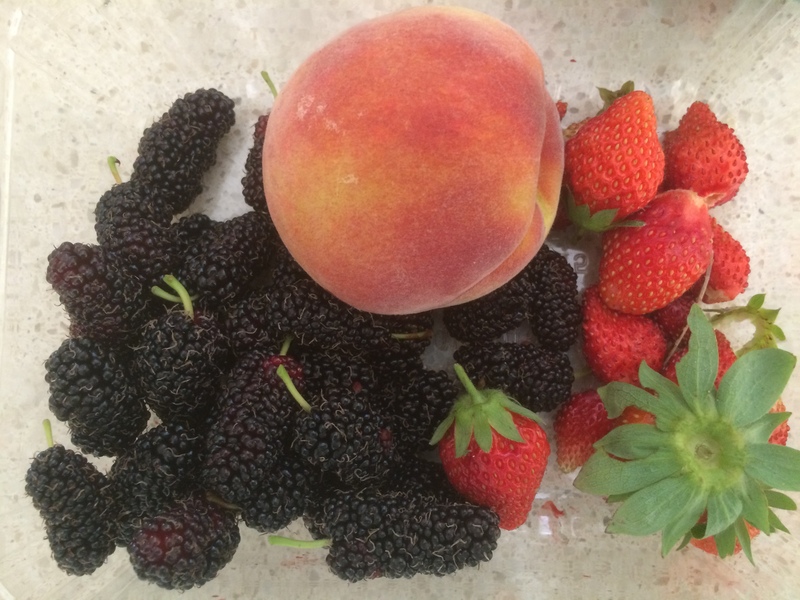 Fruited from the first season and hasn't looked back - just keeps on giving. 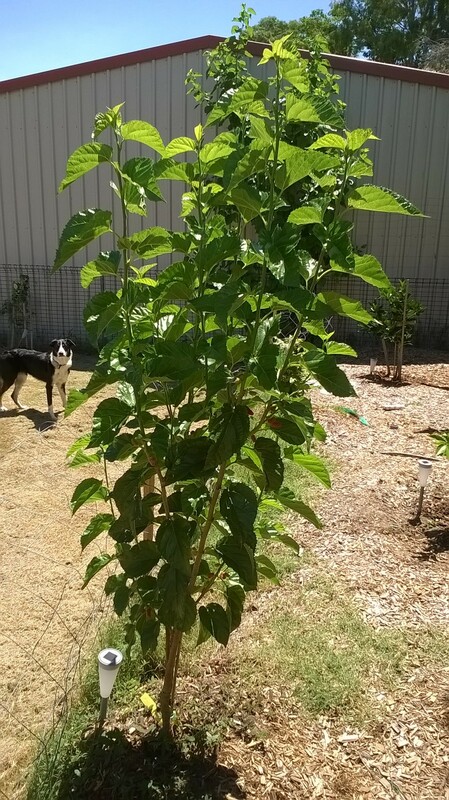 Have just been given some chooks so I'm sure the mulberry tree are going to enjoy sharing its spot with them. Cut it back a little late but even so covered in fruit. It is in the chook pen now so should get lots of nitrogen from now on. reminds me of my childhood coming home with a stained mouth and hands and saying to mum "no mum i didnt steal the neighbours fruit." 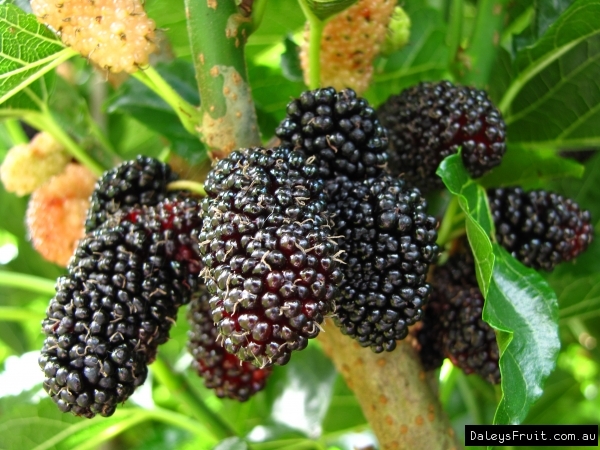 I have always wanted to grow a mulberry tree. I like the taste of the fruit. 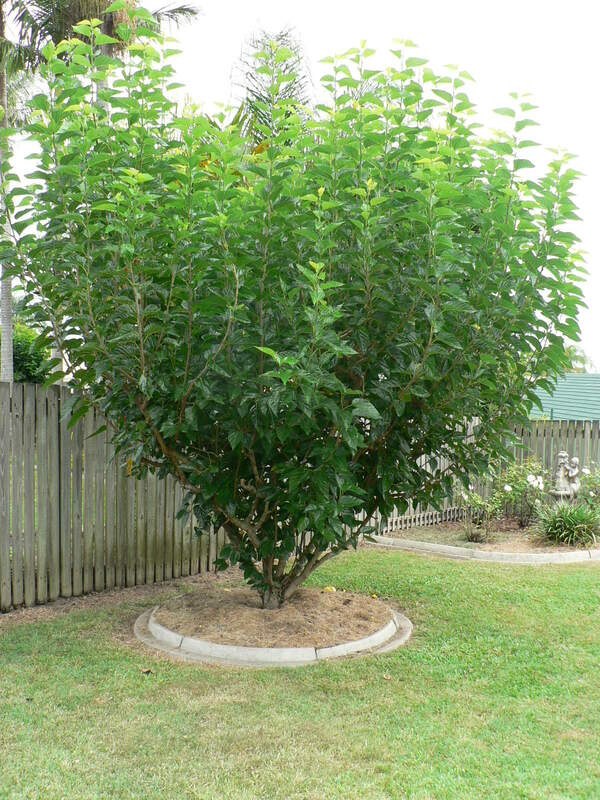 Comments: - As the first fruit of spring, before fruit fly and coastal humidity start taking their toll, this is my favourite fruit tree for Sydney. Comments: - Love the fruit. Gorgeous tree. 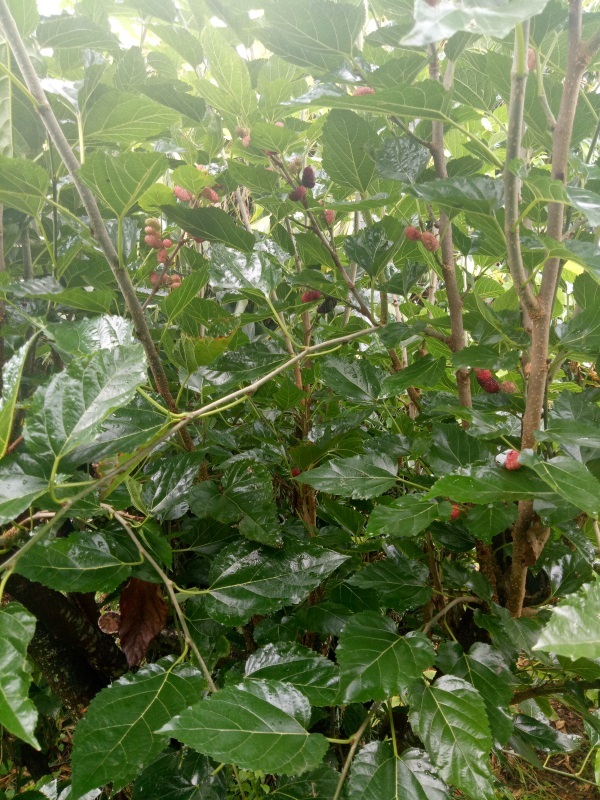 Grew really quickly and I had fruit in January after I first planted it in November 2013- this is unusual as main crop is in september/october and this year I was picking 12 berries a day. This was really it's first season so really impressed. Comments: - The tree has grown very well and after 1 year we have started picking tasty fruit. Against wall in full sun. Looking happy. Some fruit last year (2008). Lots of green fruit now (august) . cut back after it fruited. 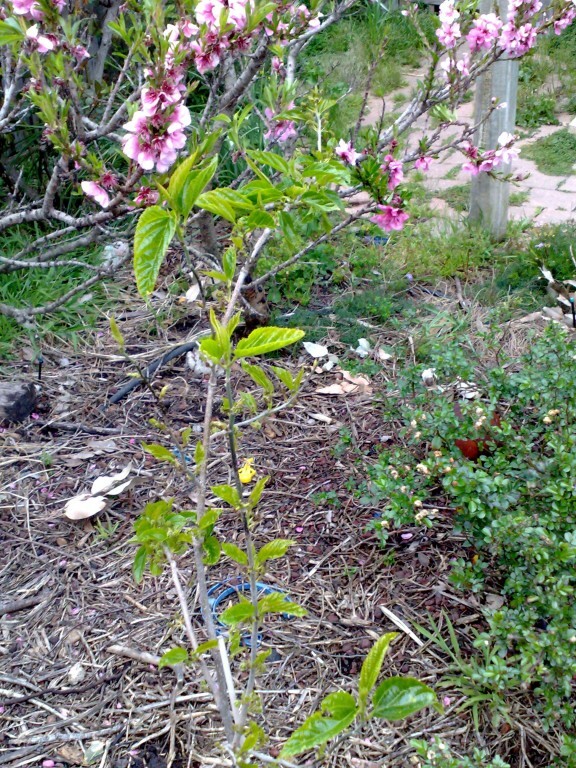 new growth with fruit late winter/early spring. 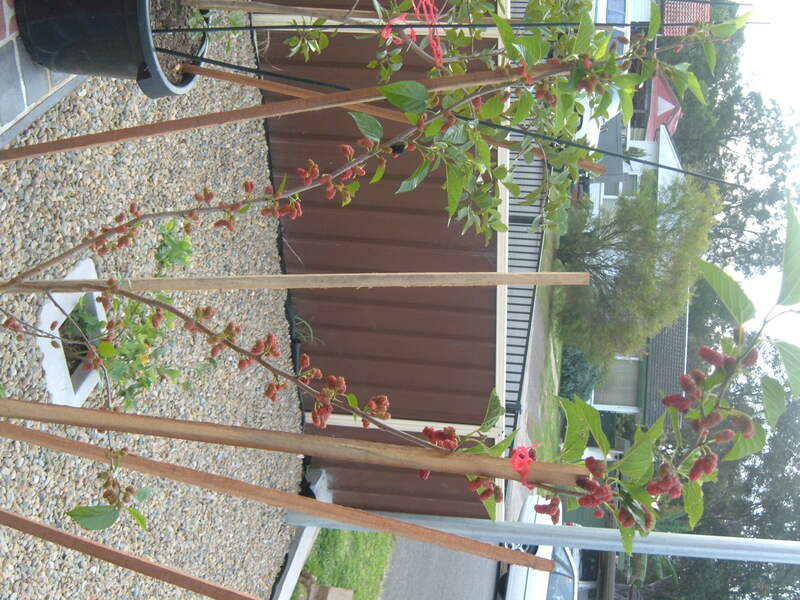 Comments: - I planted it last winter and it is showing steady growth, there are lots of lovely new leaves and fruit. it competed last summer with an old orange tree but that has now been removed so it should have access to more water and nutrients. This tree is doing beautifully in a large pot. It fruited twice last summer and was the tastiest mulberry I've had. 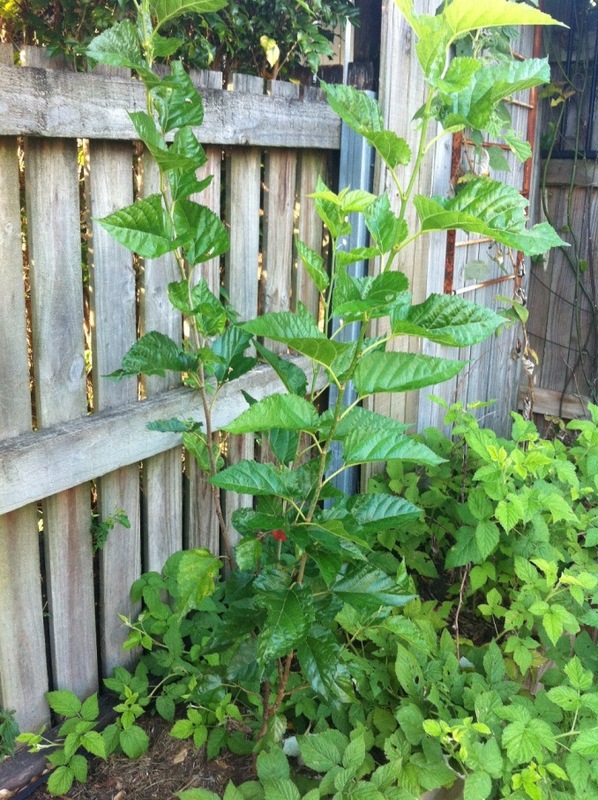 I pruned it in autumn/early winter, it did lose it's leaves. 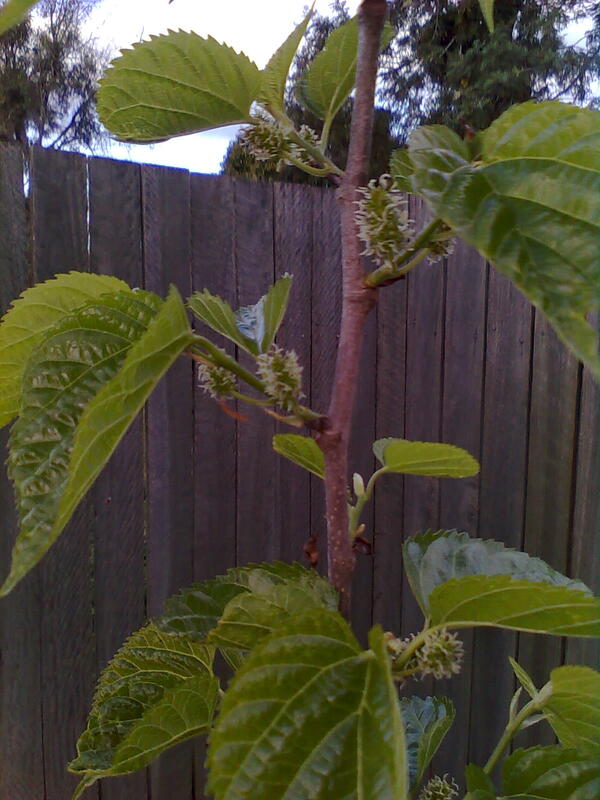 At the moment it is loaded with developing fruit and new leaves. Comments: - Only had short while. About 8 berries this year. 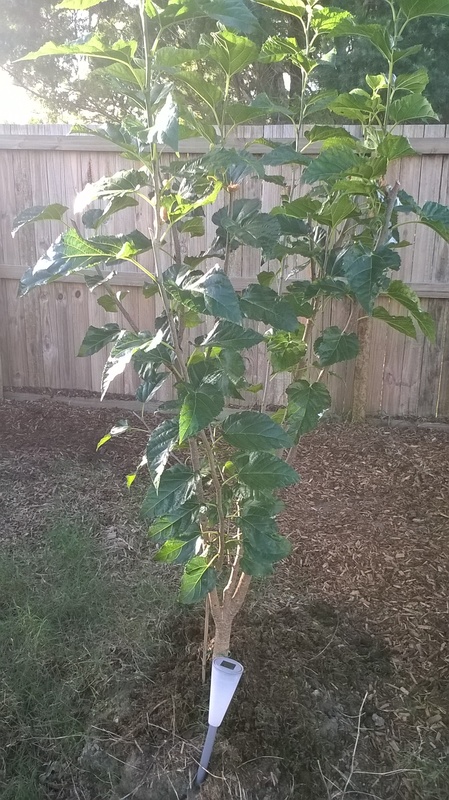 Espaliered into a fan on 2m high trellis. 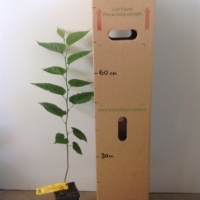 Recent purchase straight from Daley's nursery at Kyogle. Didn't have this one yet, and loved berries and silworms as a kid. Good jam fruit too. Dwarf for extra space. It's right next to a dwarf Red Mulberry but for some reason it's never had fruits to full growth. This year, with high drought was the first time it;s grown fruit but the birds ate them all so I never got to try them. The fruits on this one are long but the ones on my Red Mulberry are very short. 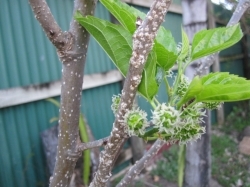 Ants keep eating the fruit off the mulberries, but I don't want to spray them because the birds like them too and I feed them to my budgies. Comments: - Very hardy plant. No transplant shock. 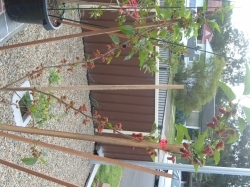 Tolerates full Australian sun and heat very well, is thriving. Extremely low maintenance, just daily watering (due to heat). Has doubled in size in ~1month since purchase. I'm very pleased with this purchase and if I had space in my garden I'd purchase more. And just a little tidbit - can also drink the leaves as tea, it has lots of health benefits. 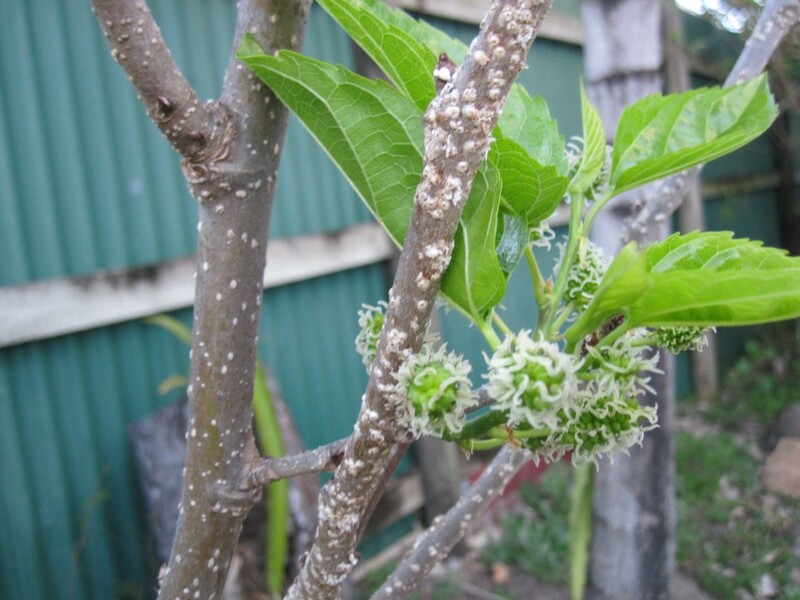 Attacked by mealybug and ants. Have been physically removing, and some neem oil. Flowers every time I prune, without fail. 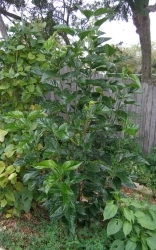 I have mine in a big pot and it gets quite a bit of water and coffee grounds and seems to enjoy. Is now about 1.8m with multiple branching points. 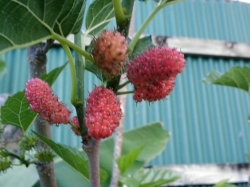 Thought I'd grow a dwarf mulberry to see what the results would be. Has put on quite a bit of growth - had flowers appear very quickly but all fell off over Winter - two made it through. 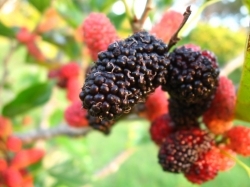 Mulberries were quite nice - looking forward to seeing how productive it can be over the years. 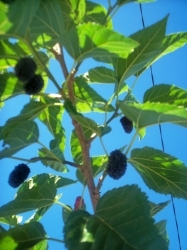 THE MULBERRY IS DOING VERY WELL IT HAD FRUIT ON IT IN SUMMAR BUT DIDN'T GET ANY AS THE PLANT IS STILL A BIT SMALL BUT IT HAS GROWN WELL AND IT HAS A LOT OF NEW BUDS ON IT.